In 1973 a pioneering record of the early years of the movement appeared in the form of a book, Six Years, by the American critic Lucy Lippard. The ‘six years’ were 1966–72. The long subtitle of the book referred to ‘so-called conceptual or information or idea art’. Conceptual art can be – and can look like – almost anything. This is because, unlike a painter or sculptor who will think about how best they can express their idea using paint or sculptural materials and techniques, a conceptual artist uses whatever materials and whatever form is most appropriate to putting their idea across – this could be anything from a performance to a written description. Although there is no one style or form used by conceptual artists, from the late 1960s certain trends emerged. Read the captions in the artworks below to find out about some of the main ways conceptual artists explored and expressed their ideas. Performance: Ewa Partum used performance as a means of creating her poetry. Her poetic works were made by taking individual letters of the alphabet cut from paper, and scattering them in city and countryside locations. By deconstructing language, the artist aimed to explore its structures. Instructions: Rather than actually making wall-drawings himself, Sol LeWitt produced instructions, consisting of text and diagrams, outlining how his wall drawings could be made. Action: Beuys referred to his performance works as actions. His most famous action, I Like America and America Likes Me took place in May 1974. 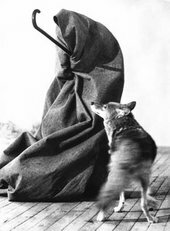 Beuys wrapped himself in felt and spent three days in a room with a coyote. The work was an expression of his anti-Vietnam War stance, and also reflected his beliefs about the damage done to the American continent and its native cultures by European settlers. Land art: To make this work Richard Long walked backwards and forwards in a field until the flattened turf caught the sunlight and became visible as a line. He photographed the work, as a means of recording this physical intervention within the landscape. Body art: Originally conceived as a performance, McLean’s poses are an ironic and humorous commentary on what he considered to be the pompous monumentality of traditional large plinth-based sculptures. The artist later had himself photographed, repeating the poses. Found objects: Some conceptual artists use found objects to express their ideas. 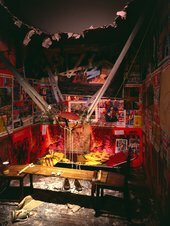 For example artists in the Italian arte povera group used all kinds of found objects and low-value materials such as twigs, cloth and fat, with the aim of challenging and disrupting the values of the commercialised contemporary gallery system. (Arte povera means ‘poor art’). Documentation: In Post-Partum Document 1975, Mary Kelly documented the relationship between herself and her son over a period of six years. Drawing on contemporary feminist thought, and in particular on psychoanalysis, it explores the contradictions for a woman artist between her creative and procreative roles. Film and video: Film and video is often used by conceptual artists to record their actions or performances. Gilbert & George’s art is a form of self-portraiture, since they almost always feature in their own work. They see no separation between their activities as artists and their everyday existence, and since 1969 have presented themselves as living sculptures. When, why and where did conceptual art happen? As a definable movement conceptual art is associated with the 1960s and 1970s, but its origins reach beyond these two decades. Marcel Duchamp is often seen as an important forefather of conceptual art, and his readymade Fountain of 1917 cited as the first conceptual artwork. The movement that emerged in the mid 1960s and continued until the mid 1970s was international, happening more or less simultaneously across Europe, North America and South America. Artists associated with the movement attempted to bypass the increasingly commercialised art world by stressing thought processes and methods of production as the value of the work. The art forms they used were often intentionally those that do not produce a finished object such as a sculpture or painting. This meant that their work couild not be easily bought and sold and did not need to be viewed in a formal gallery situation. It was not just the structures of the art world that many conceptual artists questioned, there was often a strong socio-political dimension to much of the work they produced, reflecting wider dissatisfaction with society and government policies. (See for example Joseph Beuys’s social sculpture). Although as a definable art movement conceptual art is associated with the 1960s, many artists continue to make conceptual art in the twenty-first century (such as Martin Creed and Simon Starling). In this interview, Tate Modern curator Jessica Morgan asks conceptual art pioneer John Baldessari, where did your ideas come from?